Discover a creative tool that will help them from their first strokes right through to their first letter with our Chunky Egg Crayons. 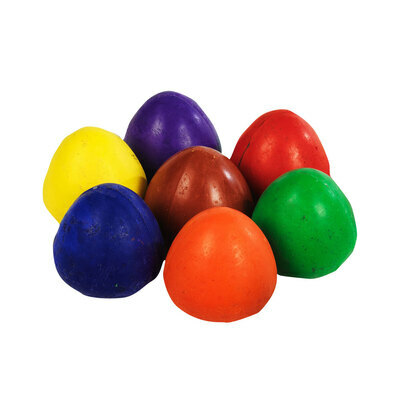 Bringing the wonder of drawing to young children, these large crayons have been expertly shaped into a tapered egg design making them easy to grip for smaller fingers. Helping to develop fine motor control and encouraging the process of mark-making, these brightly coloured crayons are extremely hard wearing with their solid construction and product bright results on all types of paper or surface. For older children, the large surface area enables larger sections to be covered quickly while the pointed tip still allows precision within the lines. The perfect tool for nurseries and primary schools, each set comes packed in its own dedicated cardboard box for easy storage and with individual slots for each colour to ensure you'll never be missing a colour. Encourage the creativity of your youngest artists with these engaging and eye-catching crayons. Alongside our Chunky Egg options, why not discover the long-respected and durability of our Chubbi Crayons? Or, if you're looking for other crafting options, we also stock a wide range of Paints and Paintbrushes suitable for use in a wide manner of different environments from care homes to nurseries.